hungry and would eat well if fed by hand. A few days of this care, and the bird started normally on her own. In January it is very common for WildCare to have a large number of first-year Red-tailed Hawks in care. This is the first winter these young birds have experienced, and the cold temperatures and heavy rains we typically experience in winter must be a shock! Most of these young birds arrive emaciated (starving) and many have injuries and a heavy load of parasites, both internal and external. Fortunately, WildCare has extensive experience caring for emaciated raptors. This x-ray shows the bad fracture to the hawl’s carpometacarpus (right) compared with the intact bone of a healthy wing (left). The bird in the video above arrived over Thanksgiving weekend with a broken wing. She wasn’t terribly thin upon intake, but for some reason she simply wouldn’t (or couldn’t) feed herself during her first few weeks in care. Medical Staff originally suspected she had head trauma that affected her vision and made self-feeding difficult, but subsequent testing proved that not to be the problem. It’s possible that, with her wing wrapped to her body, the bird took longer to be comfortable hopping on and off the perch to access her food. The hawk was obviously very hungry (typical for these winter-intake birds) and, when Director of Animal Care Melanie Piazza discovered she would gladly eat from tweezers, she hand-fed the hawk twice a day until the bird finally recovered enough to feed herself. This hawk has made a stunning recovery. The wing had been very badly fractured, as you can see in the x-ray above, and Medical Staff was very worried the wing would not heal well enough to allow her to fly. Fortunately the hawk surprised us all. She is fully flighted, as well as fierce and wild once more. This bird will be released on Friday, January 18 at noon PST in a livestream on the Dodo Facebook page. Watch live at noon, or check out the repost on WildCare’s Facebook page. Another Red-tail (left) was our 7th patient of 2019 (her patient number is 19-7). She arrived when a rescuer in Sausalito saw her trying to eat a dead gull next to a dumpster. When the rescuer approached, the bird didn’t fly away, which was an excellent indicator that she needed help. Any wild animal that lets you walk up to her is in trouble! A call to Marin Humane got her transported to WildCare. The bird was very chilled upon intake. Staff and volunteers heated dry towels in the microwave and wrapped them around her to warm her gently and quickly. Can you imagine how good that soothing warmth must have felt to this bird? Once she was warm, Medical Staff gave her subcutaneous fluids and placed her in a heated incubator overnight. She was too weak to stand at that point (see photo to the right) but, the next morning, staff was pleased to see her standing up and alert. X-rays and blood work the next day showed the bird was uninjured, but she was dangerously emaciated, and she carried an astonishing load of parasites including flat flies, bird mites and intestinal worms. The introduction of a large quantity of food to an emaciated patient is very dangerous, so bringing this bird back from her starved state has been a slow process. Offering the wrong food to a severely emaciated animal will result in death, and it is impossible to tell if a bird is emaciated just by looking at him. This is one of the many reasons we ask rescuers to not offer any food or water to rescued animals before they bring them to the Wildlife Hospital. WildCare starts emaciated raptors on a tube-feeding protocol using a special elemental liquid diet. Blood work is checked every three days, until eventually the results of the tests indicate that the bird is ready for solid food. Even then, only small pieces of organ meat are offered at first, until the bird can finally return to her natural diet. Emaciated birds are kept in an incubator to allow their bodies to use energy for growing and healing instead of keeping warm, and we also give the birds daily subcutaneous fluids to prevent dehydration. 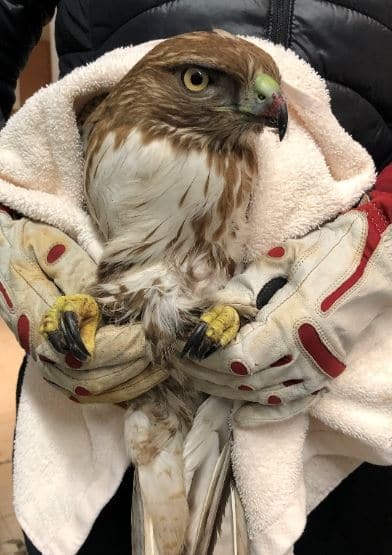 Successfully graduating emaciated birds through this process can take days to weeks, but the effort is worth it when a gorgeous raptor like this one returns to health. We anticipate that this bird and the two other emaciated Red-tails currently in our care will make a full recovery. What should you do if you see a grounded hawk? As mentioned above, finding emaciated first-year hawks is a common occurrence at this time of year. What should you do if you see a hawk on the ground? First call WildCare’s Living with Wildlife Hotline 415-456-7283 and speak to one of our trained operators. They can help you assess the situation and determine the best way to get help for the bird. Our Hotline operator may instruct you to capture the bird yourself and bring her to the Wildlife Hospital. In that case, heavy gloves, a large towel and a box are the best tools. Remember that even an emaciated or injured hawk has strong talons and a sharp beak. 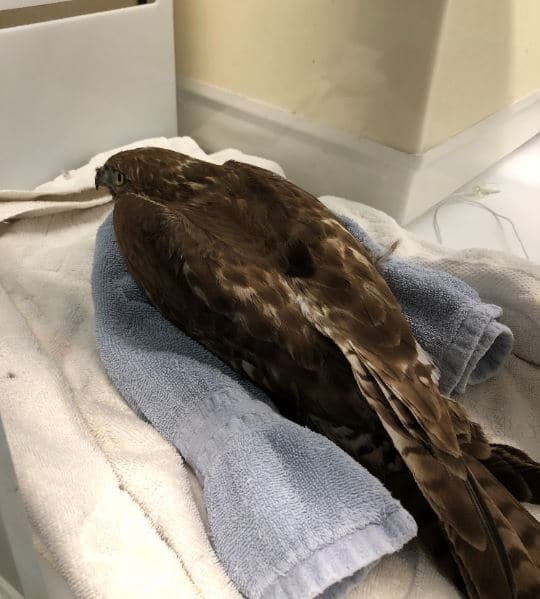 Call for advice 415-456-7283 and wear heavy gloves and eye protection before approaching a grounded hawk. To write that “any wild animal that lets you walk up to her is in trouble”, is inaccurate with deer/fawns. Aren’t other babies left alone while Mama goes out for food?